The air screw is a small (5mm in diameter) slotted brass adjustment screw located on the inlet side (air filter side) of the carburetor. The airscrew is a fine-tuning adjustment designed to allow the carburetor to be slightly adjusted for variances in atmospheric conditions. The airscrew works with the pilot/slow speed system of the carburetor, mainly affecting the engines initial starting, idling and initial power delivery. Proper adjustment of the airscrew can offer direct feed back on the necessary setting required for the pilot jet. The airscrew is adjusted in a rather straightforward manor. The pilot jet is a medium size (¾-1”) brass jet located inside the float bowl next to the needle jet/main jet location. 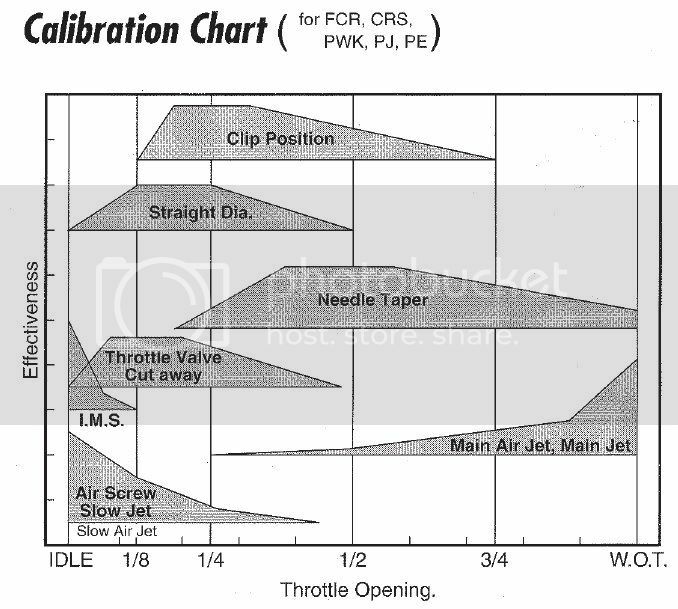 The pilot jet meters the fuel required for engine starting, idling and the initial throttle opening 0-1/8. The slide not only monitors how much airflow goes into your engine (its main job). But it has various angles cut on the bottom of the slide to monitor airflow at low RPM’s. This is referred to as slide cut away. The slide cut away is measured in 4.0, 5.0, 6.0 etc. (see attached chart). The higher the number, the larger the cut away the leaner the slide setting is. 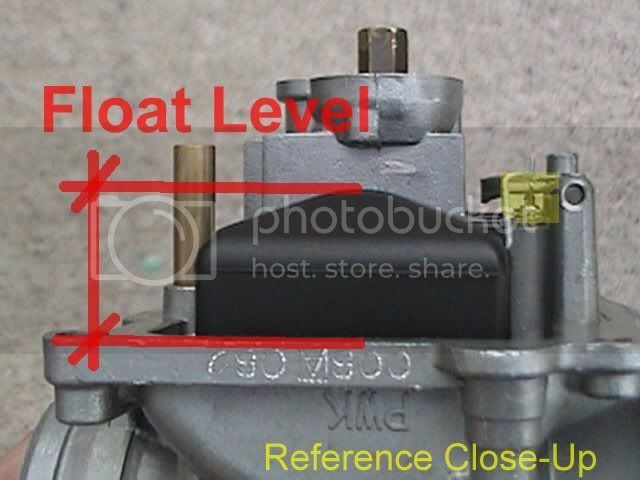 The jet needle is the most important component in determining your carburetors jetting. The needle is broken into 3 main functions; Diameter, Length, Taper. 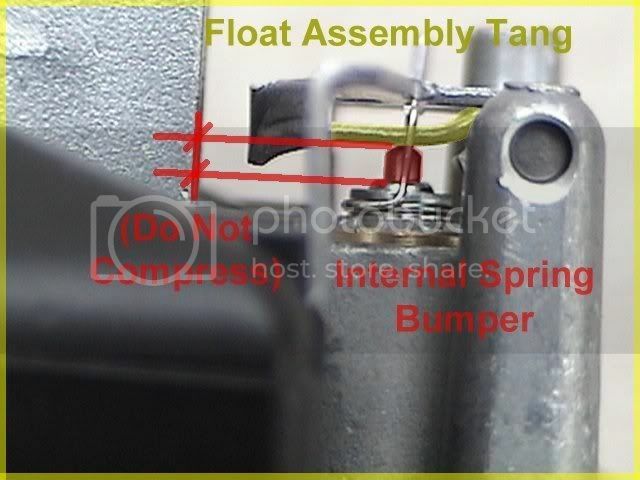 These needle functions have a large effect on the carburetors jetting from ¼ to ¾ throttle. In the following paragraphs we will explain the needles functions and how to adjust them. The main jet affects the jetting in the upper quarter of the throttle position. Coming into play at ¾ throttle on through to full open throttle. Even though most people relate the main jet to their carburetor in general. The main jet is only responsible for the last ¼ of the jetting. The main jet does not effect the jetting for starting and idling. It plays no part on low RPM or mid RPM jetting either. 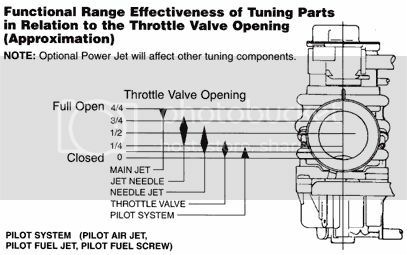 The main jet is very important to your machines overall tuning, but should never be over emphasized at the expense of needle tuning or other facets of your carburetion tuning. 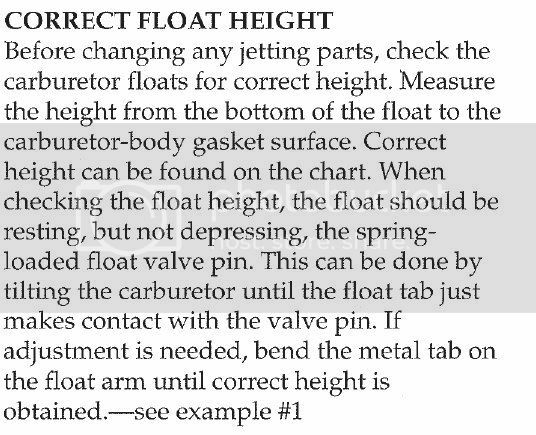 I have had a lot of questions in reference to my article on carburetor jetting, so I have simplified the procedures to elevate as many questions as possible. 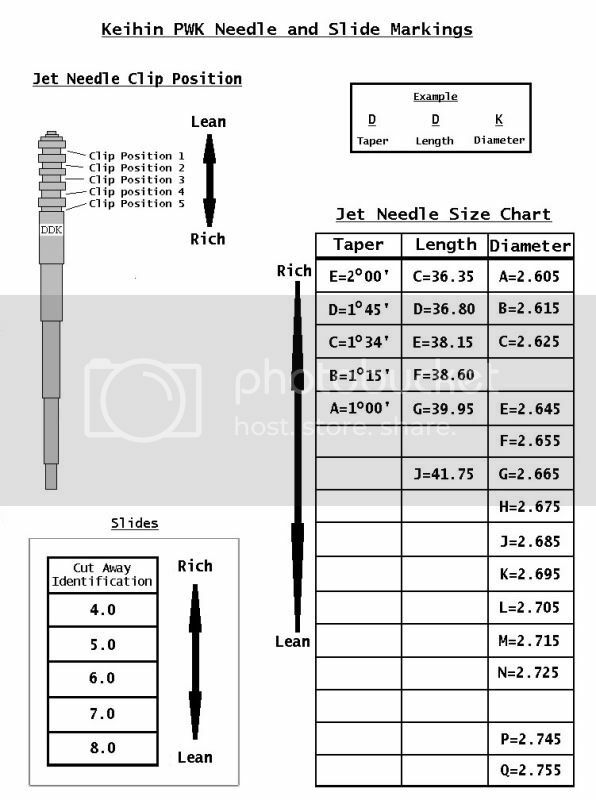 Step 1: DETERMINE THE CORRECT NEEDLE AND OR NEEDLE JET. Whether or not your carburetor is a MIKUNI or a KEIHIN, it does not matter. This is the most important step in jetting your carburetor--period! Step 2: DETERMINE THE CORRECT PILOT JET. Step 3: DETERMINE THE CORRECT MAIN JET. 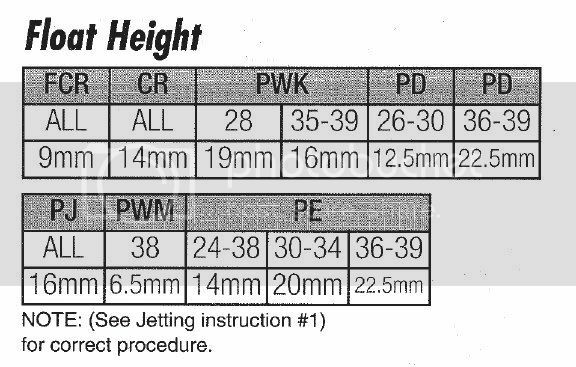 The main jet selection process is easy once you have the correct needle diameter or needle jet. You now only have to correct a rich condition from 3/4 throttle on up and you know what a rich condition sounds like. 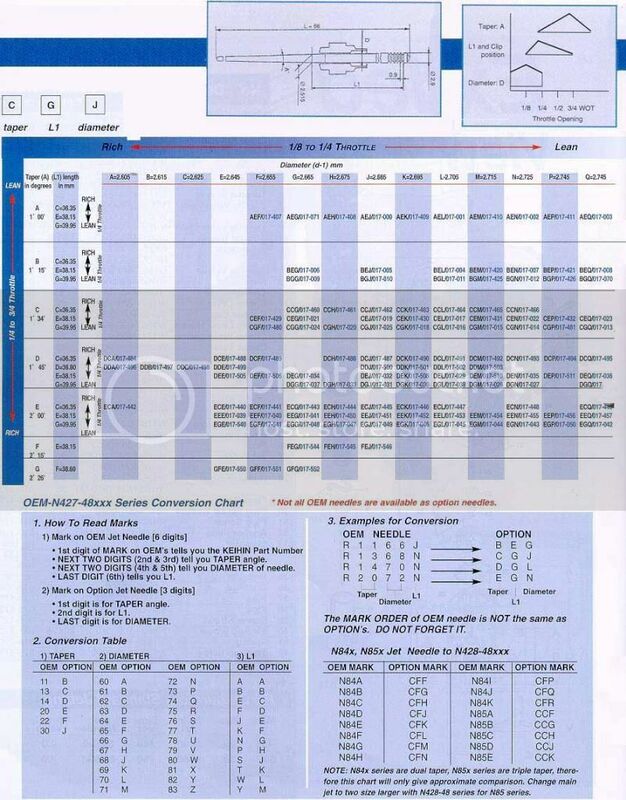 Your pilot circuit is correct and without bog. Step 4: DETERMINE THE CORRECT NEEDLE TAPER AND CUT AWAY. This step in the jetting process can be made very simple if you remain close to stock. 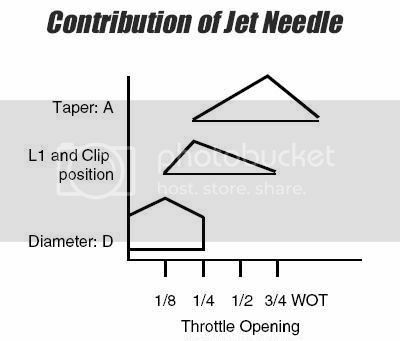 However, your needle taper is adjusted for 1/2 throttle to 3/4 throttle. Start off with a rich taper (shallow taper angle) and keep going leaner (steeper taper angle) until it will not maintain constant RPM at 1/2 throttle (runs erratic). Go back to the leanest taper angle that ran the smoothest at 1/2 to 3/4 throttle and that should be the correct taper. From an article by Don K. Courtney. To check to see if your pilot jet and air screw are adjusted right, warm up the motor and let it idle as low as possible while still running smooth. From idle, whack the throttle wide open then let it close completely. Listen to the motor. If it bogs right when you whack the throttle open, then revs up, turn the air screw in 1/2 turn then try again. Do this until it revs up crisply. After the motor revs up, listen to it revving back down. If the revs drop quickly, and the motor starts to bog, and/or die, then you're too rich on the air screw, back it out 1/4 turn at a time. If after you let the throttle off the motor tends to run on and on while revving down very slowly, you're too lean and need to turn the air screw in 1/4 turn at a time. You want the revs to come up from idle quickly and smoothly, then drop back down to idle the same way. If you turn the air screw all the way in and it still needs to go further, then you will need a larger pilot jet. The opposite is also true: if you are backing the screw out so far that it darn near falls out, you will need a smaller pilot jet.